Over the years fries have been discouraged as an unhealthy approach to eating. But even then, the obsession hasn’t seized. There are those who can’t resist the temptation to eat fries on a regular basis. Unfortunately for such people, you make yourself susceptible to the various health conditions. This is why the air frying came into being. Basically, it’s the method by which you use air circulation to fry your food instead of the regular oil. I know what those of you who have never used these kinds of cookers will say, is it delicious, will it kill my craving? Yes, it’s delicious and it will not only satisfy your fries craving but you will also consume healthy food. However, note that the air fryer isn’t only meant for the French fries, you may also use it for other meals. 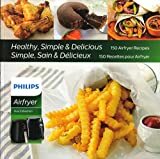 I’ve found the air fryer cookbooks to be effective in suggesting unique recipes to use as well as how to use the air fryer. The article aims at giving you the best air fryer cookbooks to buy. For most people, air fryers are only used for fries which is not at all true. You can use the air fryer for different other styles of cooking as you will see in this book. I’ve seen quite a number of cookbooks that claim to be the complete guide but they never give you the value you are looking for. For this book, you have basics on how to use the air fryer it then gives you information on how you can cook two different recipes at a go. It offers over 100 recipes which include vegetarian recipes, meat and poultry meals. This book allows you to use the air fryer for baking, roasting and grilling your food. The aim is to use the air fryer in all capacities. It goes ahead to give you the advantage of using the air fryer in regards to the detailed nutritional information. Unlike most other cookbooks that will let you guess how long you want the food cooked, this cookbook gives you the timing vs temperature direction. Lastly, it will give you the guide to choosing an ideal air fryer. If you are one who is looking forward to cutting your oil intake then this book is a must have as it will guide you to the versatile options available. If you are looking for a great book to begin the air frying method of cooking, this is the book of choice. It’s your way into the healthy, simplistic yet delicious meals. To start with, it gives you 150 recipes that are fun to make. The book is mostly designed to suit the Philips air fryer though you may use it for other air fryers as well. Its aim is to make you cook almost all your favorite food with the air fryer thus limiting the oil you consume. You can further make any of your regular food healthy when you cook them using the air fryer because it limits the amount of oil you use. You have the required tips to making the meal delicious. Furthermore, the cookbook gives you suggestion about the 30 minutes meals. With the Philips air fryer book, you have everything you need to start enjoying the various meals. We all start somewhere at anything and this book is your best bet when you want to start the air fryer cooking. The air frying technique is basically the concept that is best used by people that intend to lose weight or maintain a healthy diet. Alice uses the recipes herein to make you maintain that healthy diet while enjoying the deliciousness. You have a collection of recipes that make it hard for you to choose the best option to go for. However, before you begin the cooking process you will be taught the ways of using the air fryer. You have the chapter to encourage you on staying motivated and away from the temptations of the world’s convenience. I know for sure that if you live alone it might be tricky to make a meal on a daily basis. It is even trickier to make the food healthy. Urvashi makes the air frying cooking easy with most of the recipes able to cook in an hour or less. When using the air fryer, you mean to cook all the healthy ingredients. Therefore, for the recipes use only the fresh ingredients, unlike many other recipes that call for the use of canned soups and other foods. Urvashi walks you through the process of using the air fryer in simple steps with the aim of helping you familiarize with the cooker. The best part is that your recipes come out having the enriched flavors and deliciousness. You can use the air fryer for your day to day use and especially when you have this book it all becomes easy because all you have to do is use the recipes in this book. In the 326 pages, you receive more than enough recipes to turn your dining experience into a memorable one. You have meal ideas from the different regions of the world with the aim of bringing most people on board. It shows you how you can have breakfast, desserts, main meal and side dishes with this single tool. When you get this book, begin making use of it in delivering high-quality fried food without using oil thus serving your family a healthy meal choice. If you are anything like me who sometimes buys a gadget and underutilize it, this book will ensure that you understand the air fryer and are utilizing it. Whether you like simple meal ideas or complex ones this book will come in handy. Are you a beginner in using the air fryer? You need Justin’s book. It gives you simple ideas and easy to follow instructions. You will start understanding the cooking process in no time. For most advanced level of air fryer cooking, you may need another book. On the downside, the book contains no pictures which make it tricky to understand for some people. The book is not specifically designed for air frying but you will have the information you need for the same. This book is your solution if your life is defined by a busy schedule and no time to prepare the best and healthy meal. People have a tendency to go for unhealthy meals when tired. With this book, you have all the ideas for an all in one pot design cooking. Whether you wish to use the multi-cooker, instant pot or air fryer, you have the recipes that help you utilize a single item. I like it because in using it then I summarize the number of dishes I would have to clean after the cooking has taken place. You have up to 140 recipes to use that feature 120 colored photos, you even have the right vessels to use for the cooking process. If you don’t have the cooking vessels, however, you can use the alternatives that are suggested in Gina’s book. All the recipes here are designed to help you lose weight or burn excess calories. Have you ever thought you can make the healthier versions of the fried foods? Here’s to the dream come true where you will use a book to make the flavorful foods that have about 500 calories. This air fryer book contains 100 recipes that are delicious but also nutritious for your health since they use lesser oil. Get to use the air fryer to bake, roast and grill your favorite foodstuffs. If you often crave for fried foods you can always use your air fryer to make a healthier version of the fries. For most people, the healthy cooking for two is next to impossible thus this book is ideal for teaching you how to cook your delicious meals. It will make all your meals flavorful and fast to cook without you having to break the budget. This book is particularly detailed to give you the list of grocery shopping to do. It goes ahead to choose the best proportions to use and how to make the meal a restaurant style meal. This book will give you the nourishing meals even when you have busy days. I know most people go for deliveries because the thought of cooking and cleaning is sometimes hard. This book teaches you how to make your quick 175 recipes and you thus have no need of buying fast food. This is the only book giving you tips on how to shop and plan for a stress-free meal. Just because you are using the air fryer doesn’t mean you have to eat food with lots of calories. You can use it to cook delicious yet healthy food. In this book, you have a collection of recipes that will suit all your taste buds. Miles makes all the recipes easy to make and full of flavor. You have your traditional fried food but cooked with less to no oil in the air fryer. You will get the most out of this book since it gives you the step by step guide into the meals you are cooking. Worry not, you don’t have to break your account to buy the ingredients you use in the recipes as they are the regular ingredients that you use. This easy to use book is meant for use by the beginners. Note that, even as a beginner you can make the wholesome and delicious meals for your family with this book. From breakfast recipes to vegetarian recipes these 137 pages will give you the guide like no other. I like it that cooking doesn’t segregate the novice and the professional chefs. This book is a good tool to use whether you are the novice or pro in cooking. For most people, the air fryer cooking is just a trend but this book will get your home cooked food to a greater level. You can use it to create your delicious, classic and easy meals guilt-free. Moreover, you have 100 recipes to help you with cooking the wholesome breakfast, dinner and lunch meals. Laurence further gives you the tips and tricks to use in getting the most out of your fryer whether you wish to use it for roasting, frying or baking. It even gives you the techniques for creating healthy, faster and mess-free meals. If you are a beginner, worry not, the book will guide you into transforming the traditional recipes to the air frying ones. For the experienced cooks or chefs, this book will enhance your culinary skills which means it has everyone covered. The air fryer genius even has recipes for the vegans and vegetarians aside from the regular recipes. Furthermore, they all give you the regular nutritional information. This book will help you understand the features and functions of an air fryer regardless of whether you have one or not. It encourages you to read the rules and instructions of the manufacturer as well as the cleaning guide. Remember to add the 1 tablespoon of oil to your air fryer recipes in order to get the same results you have with the deep-frying method of cooking. The book gives you 365 recipes for a suggestion to cook on your day to day recipes. With its clear images, you can easily use it even if you are a beginner. You have every reason to regain your ideal body if you had gained fats using Jamie’s book. The air frying technique is the trending method of cooking your favorite foods. This tool is a savior to most people who find it hard to resist the deep-fried meals. Of all the books I’ve seen this is the best book that balances both the images and instructions. It makes it easy to use for those who don’t like reading a lot. In fact, the most important thing is that you get the picture of what the meal you are cooking looks like before cooking it. You have a list of about 70 recipes for various dishes as well as 15 more for sauces. Of course, there are fewer recipes compared to most books that offer hundreds of recipes. However, even with the fewer recipes you will get an understanding of how to use the air fryer. Todd made this book for you to use if you buy the Todd air fryer. Unfortunately, using the cookbook with other air fryers might be tricky because the adjustments done to the Todd air fryer may not be the same with other air fryers. Sanders is a great sous chef who has seen a career growth in the Gordon Ramsey restaurant. With this book, she aims at making the best guide for using the air fryer to your full potential. You have a list of meals to prepare every single day. The meals in here are easy to make yet tasty. The best part is that each recipe is less than a page long. You can follow the instructions to fully utilize the apparatus. Michelle has 150 recipe ideas for vegans and all other people can utilize the remaining recipe ideas. Here’s something you didn’t know, you can cook anything in the air fryer. Go ahead and make quick tasty, healthy meals. When you buy your air fryer you should make full use of it. The cookbook gives you suggestion into how to cook healthy and yummy recipes. What makes this cookbook further ideal is that you can use it with all other air fryers. You will even use it for convention and induction air cooker. The book has a total of 100 recipe books that are simple and easy to make. The book shows you step by step guide of how to air fry your food. Is air fried food healthy? Yes, they are healthier than using the deep-frying method but it’s still a form of frying which means you should use even the air fried food in minimal quantities. Of course, if your solid reason for eating the air fried food is to reduce the crave for deep-fried foods and reduce weight you will succeed. Notice that its better than using the deep-frying method. And yes, it’s the healthier method of cooking your foods but not the very best. Of all the foods you consume, the deep-fried foods have the highest level of fat content. According to most manufacturers, the air fryer will cut the fat content by up to 75%. The air fryer requires only the use of a tablespoon of oil. It’s true that the air fryer can cut the oil content in your food. The fun part is that your food though air fried retains the same color and moisture. As we all know, this will have a major impact on your body. The truth is you can make exercise a regimen for weight loss but unless you take a keen interest on the food you consume, chances are that you will retain the same weight and make minimal changes. To reduce your weight, you also need to check the food you are consuming. Deep fried food is high in calories just as they are high in fats thus if you want to reduce your waist line, reduce your deep-fried food intake. Choosing to consume air fried food will ultimately reduce the number of calories consumed. When eating fried foods, you may consume a compound called acrylamide. This is a compound that is produced in carbohydrate whenever you subject them on high heat. This compound has been associated with diseases like cancer. Luckily in using the air frying method, you reduce the possibility of the acrylamide compound formation. Of course, that doesn’t mean that you won’t have other harmful compounds formed when air frying but its minimal than when you deep fry. If you love deep fried food then this is the best way to cook them as it’s way healthy than the other deep-fried method. Your food is cooked with less oil but the result is the same as the one you have when you deep fry your food. Your food comes out crunchy, moist and flavorful so you have every reason to buy the air fryers. Frying your best meal in the air fryer is also faster than when you have to use the oven as opposed to deep frying. Considering we all want to do everything fast, it appears the air fryer is the healthiest option than deep frying. Take all the foodstuff that you comfortably deep fry and air fry them. This may include the chicken and potatoes. You can also try frying the sweet potatoes or yams. You can even air fry your favorite turkey. There’s almost no restriction as to the food you could cook in it but choose those that you frequently deep fry. There’s so much information regarding the air frying method of cooking especially because it’s trending today. Whether it’s the healthiest choice of cooking is something that medics are still disputing. 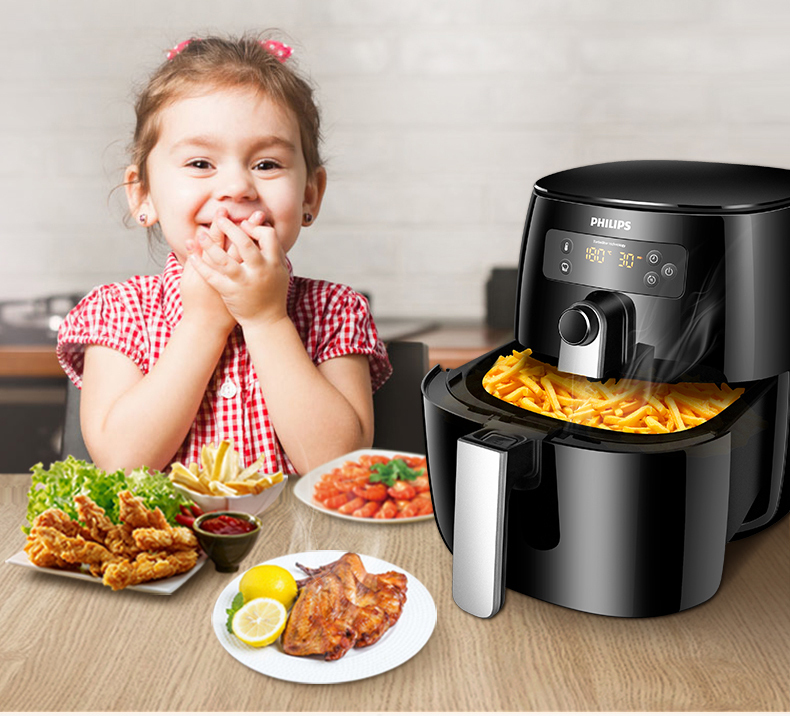 Nevertheless, when you use the best books which in my opinion is The Complete Air Fryer Cookbook, you could gain benefits of cooking healthy meals with it.